THEME: Assemblage, the transformation of discarded materials reassembled to form a new unexpected creation, with a new life and meaning. 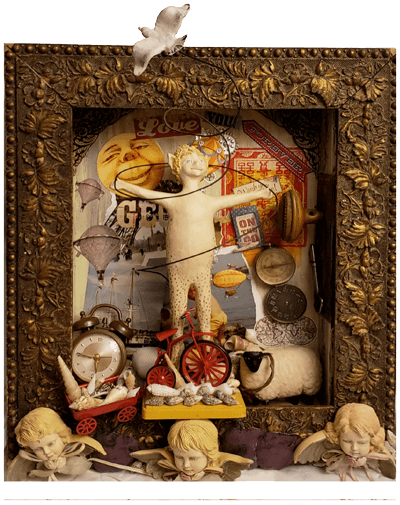 Assemblage art can be metaphoric, lyrical, spiritual, poetic or just insane, it can tell a story or be a shrine to a lost love. The ever-changing deconstructed, constructions of encapsulated worlds that can only exist in a state of perpetual flux. ELIGIBILITY open to all artists professional and amateur 18 or older. ENTRY FEE $35.00. non-refundable. Use the form at right to register and pay the fee or contact Patty directly. COMMISSION Gallery Z takes a 35% commission on all artwork sold. Payment will be made at the close of the exhibit.